The Tapash Sustainable Forest Collaborative (hereafter referred to as Tapash) proposal finds its’ basis in the Okanogan-Wenatchee Forest Restoration Strategy (2010, in prep). The Forest strategy was/is being developed through a collaborative effort between the Forest Sciences Lab, the Okanogan-Wenatchee Supervisors Office, and the Naches Ranger District. The strategy has received a science review (10 reviewers), a forest level review assessing implementation feasibility, and a review by the provincial advisory committee (currently underway). The strategy is also being prototyped on the Naches Ranger District through application on 2 restoration projects (1 in the planning phase and 1 in the implementation phase). The restoration strategy is science-to-field implementation based. The methodologies and protocols utilized in the strategy were/are being co-developed by forest science lab scientists, forest resource specialists, and implementation specialists (e.g., marking crews). This type of direct interaction and continuous communication provides for positive feedback and shared-learning opportunities. This Tapash proposal considers a 920,000 acre landscape and prioritizes initial treatments (FY10) in the southern most portion of the analysis area where planning has been completed and the strategy is already being implemented. Lands incorporated include Naches and Cle Elum Ranger District dry and mesic forest types, the Oak Creek, L.T. Murrary, and Clockum State Wildlife Areas, the Ahtanum State Forest, and other WDNR administered land. These initial treatment areas establish a core/central location from which restoration activities would expand over the next decade and beyond to include the central and northern portions of the Okanogan-Wenatchee N.F. Yakama Nation, State (Washington Department of Fish and Wildlife, Department of Natural Resources), and private (TNC) lands. The initial proposal (FY10) implements a diverse array of treatment methods including prescribed fire of natural and activity fuels (approximately 2,700 acres), mechanical treatments through pre-commercial treatments (approximately 200 acres), and road decommissioning (approximately 8 miles). Given the current planning cycle, restoration treatments utilizing commercial methods and biomass removal are expected to be implemented beginning in FY11. This proposal would utilize a diverse array of implementation vehicles including classic and stewardship contracting, grants, Conservation Corps crews, and agency force account. The strategy considers multiple scales from the landscape to the stand-level. Information from the Central Washington Landscape Analysis (CWLA) (2,300,000 acres), the Mid-Naches Conservation Action Plan (375,000 acres), and the Dry-Orr Landscape Analysis (70,000 acres) form the scientific basis and need for active ecosystem restoration. This strategy is founded first in ecological principle but then also recognizes individual ownerships and missions. The strategy strives to recognize opportunities to develop and move forward with common objectives across ownership boundaries. The strategy is a science-based landscape-level integration of vegetation departure, fire flow, wildlife habitat needs, and aquatic resources. The strategy addresses the restoration of vegetative composition, structure and pattern in dry and mesic eastern Cascade forest communities. The strategy specifically emphasizes the retention of large and very large old trees. Modeling scenarios included in the strategy take in to account current and future range of variability in consideration of global climate change and the potential for a warmer, dryer environment across the local landscape. We expect the outcome of implementation of this strategy to be an increase in our restoration footprint on the landscape with a corresponding increase in overall forest resiliency. This proposal would implement stand-level treatments that will be designed based on the associated landscape-level analyses. The proposed restoration strategies would remove undesirable species and trees in the small and medium diameter size-class with the objective of maintaining and restoring landscape structure and pattern. The strategy emphasizes the strategic placement of thinning treatments and the use of mechanical and prescribed fire techniques to ultimately reduce the potential for uncharacteristic wildfire effects across the treated area and ultimately, the reestablishment of natural fire regimes typical of the dry and mesic forest types. The Tapash formed around a coalition of public, non-profit and tribal land managers organized under a Memorandum of Understanding between five cooperating agencies and NGO’s. Established in 2006, The Nature Conservancy, Washington Department of Fish and Wildlife, Washington Department of Natural Resources, The Okanogan-Wenatchee National Forest, and the Yakama Nation, have been working cooperatively to overcome the limitations created by intermixed land ownership in central Washington. The members of the collaborative have recognized the need to work together, across ownership boundaries, to ensure that lands are managed ecologically across the larger landscape. Using a process developed by The Nature Conservancy (Conservation Action Planning), scientists, managers and implementing staff from these groups and other interested parties have structured the scope and overall project vision to define desired ecological outcomes and clear strategies to identify and implement shared goals. Ongoing land acquisition to mitigate increasing wildland urban interface (WUI) development. The use of science-based management tools, including prescribed fire to restore forest health. The use of the best available science to actively manage for restoration of forest health. Attracting new investments that demand forest restoration products. Three of our most successful collaborative efforts include: the Central Washington Landscape Analysis project; the Bald Mountain acquisition (10,240 acres); and the Tieton Canyon acquisition and associated Elderberry North cross-ownership (WDFW, WDNR, and USFS) prescribed burn (1,600 acres). We anticipate continuing implementation of these projects in FY11 and beyond. The Tapash is working to refine its organizational structure through the hiring of a coordinator, the formation of workgroups of staff practitioners to work toward shared goals, and the creation of a steering committee and an executive board to establish and prioritize strategic direction. The Tapash has expanded its sphere of work from the Naches River drainage and the Naches Ranger District to include the Cle Elum Ranger District. 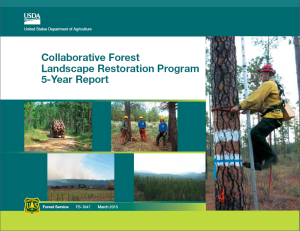 Refined methodologies and protocols will be shared between ranger districts, stakeholders, and other interested working groups as the restoration landscape increases and new partners come onboard. Climate change is likely to increase the challenges for sustainable forest management in eastern Washington, including issues associated with wildfire and forest insects and pathogens (Franklin, Hemstrom, Van Pelt, & Buchanan, 2008). Logical management responses to climate change – such as reducing stand densities and fuels, treating landscapes, and restoring drought-tolerant and fire resistant species and tree size classes – are consistent with management responses to other important issues, including forest health, wildfires, old and large tree structures, and protection of wildlife habitat (Franklin, Hemstrom, Van Pelt, & Buchanan, 2008). Fire suppression costs are greatly influenced by the amount of uncharacteristic wildfire. Such uncharacteristic wildfires are more difficult and expensive to suppress (Agee, 1993). The application of ecological restoration prescriptions leads to decreases in uncharacteristic landscape conditions and associated increases in landscape health and terrestrial habitats (Hann, Hemstrom, Haynes, Clifford, & Gravenmier, 2001). Wildfire suppression and preparedness costs will likely not decline in the first years of implementation because initial treatments do not affect enough area to compensate for continuing increases in uncharacteristic fuels (Hann, Hemstrom, Haynes, Clifford, & Gravenmier, 2001). Our proposal selects and prioritizes projects within the analyzed landscape based on opportunity to reduce risks. This can result in lower per-unit-area cost and increased effectiveness at achieving integrated objectives, and is likely to result in reduce wildfire management costs within our chosen landscapes. Whether the proposal would reduce the relative costs of carrying out treatments as a result of the use of woody biomass and small-diameter trees and whether an appropriate level of non-federal investment would be leveraged in carrying out the proposal. Tapash has over six non-federal full-time equivalents (State agencies, tribal, NGOs and university staff) working directly on coordinated landscape-to-stand restoration outcomes. Tapash members are actively pursuing private and state grants/donations for FY11 of $600,000. 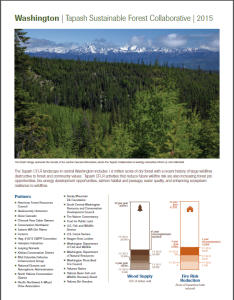 Tapash has successfully facilitated and continues to facilitate acquisition efforts to reduce fragmentation leading to increased wildland urban interface (WUI) in a mixed-ownership landscape. To this end, the Tapash has leveraged over $7 million in State funds. This effort is supported by local and Federal government. The sale of small-diameter trees should reduce costs; however, savings will be dependent on market conditions. Local infrastructure includes a small-diameter mill operated by Yakama Products, as well as mills at greater haul distances. There is active negotiation underway of an investment of a hewsaw in Ellensburg. Tapash is active in developing a baseline assessment of biomass to provide investors knowledge and confidence relative to the level of capital investment. Work including contracting with TSS consultants to produce a report on Wood Supply Assessment for Commercial Scale Biomass Power Cogeneration and Biomass Utilization Projects in Central Washington, along with other analysis, such as CWLA. Central Washington University is in the process of negotiating a contract that would convert their heating system to biomass, thus increasing new local demand. Development and implementation of stewardship contracts. Utilizing youth conservation crews (e.g., Americorp, Washington Conservation Corps, Northwest Youth Corps, Earthshare Youth Corps). Many of these programs include an apprenticeship program and other career training. Assisting Central Washington University in the development of a biomass energy project from conception to construction to startup. Supporting existing infrastructure (physical and labor) by providing a predictable flow of commodity. Exploring potential educational opportunities with Central Washington University and University of Washington for emerging technologies (i.e., green technologies, energy conversion, forestry, ecosystem services). Maintaining active communication and interaction with traditional forestry schools and associated programs. Exploring carbon, water, renewable energy credit markets, and third-party certification by encouraging alternative manufacturing and energy industries within local communities and tribal entities. Expanding the reach and lessons learned from early successes and failures throughout the Tapash landscape as identified in the Central Washington Landscape Analysis. The Central Washington Landscape Analysis project provided early guidance and is currently contributing to the refinement of the Okanogan Wenatchee Forest Plan revision process through information sharing between management and research entities. Maintaining active membership in The Western Fire Learning Network, where science and applied management strategies are shared with other collaborative groups. Knowledge gained through development and hands-on application of the forest restoration strategy will be shared by newly educated staff to mentor and advance local skills across the restoration landscape. Prototyping and sharing of restoration-based stand prescriptions through inter- and intra-agency workshops in FY10 and beyond. Developing networks and sharing knowledge to promote the establishment of the infrastructure and technology for biomass utilization. The Tapash website (www.Tapash.org) will serve as a portal for information sharing. Attending and presenting practices, accomplishments, and outcomes of projects at conferences and symposia. The collaborative partners will produce peer reviewed products that will contribute to implementation, monitoring, and adaptive management (e.g., Wenatchee Forest Sciences Lab, Pacific Northwest Research Station, and the University of Washington).